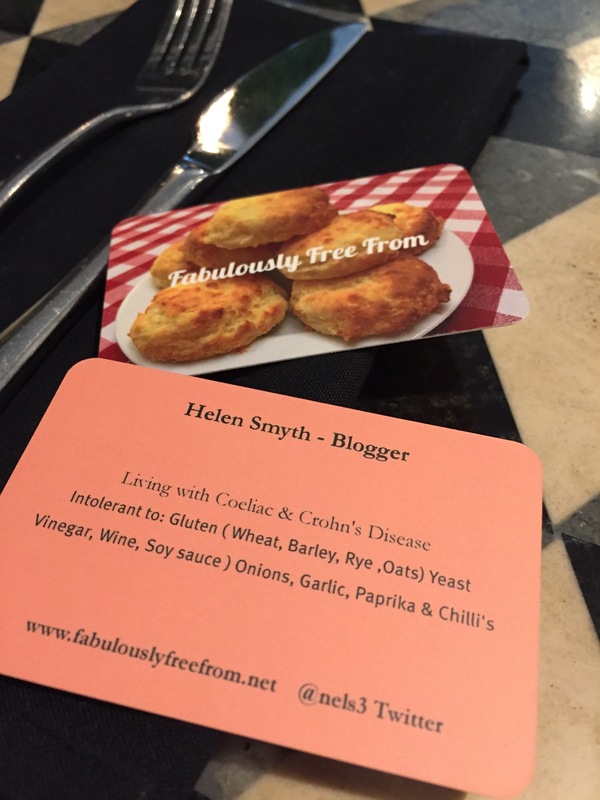 Fabulously Free From | Living Gluten Free, fabulously! In June 2018 after much preparation I travelled to California with my husband , this was going to be a holiday of a lifetime . 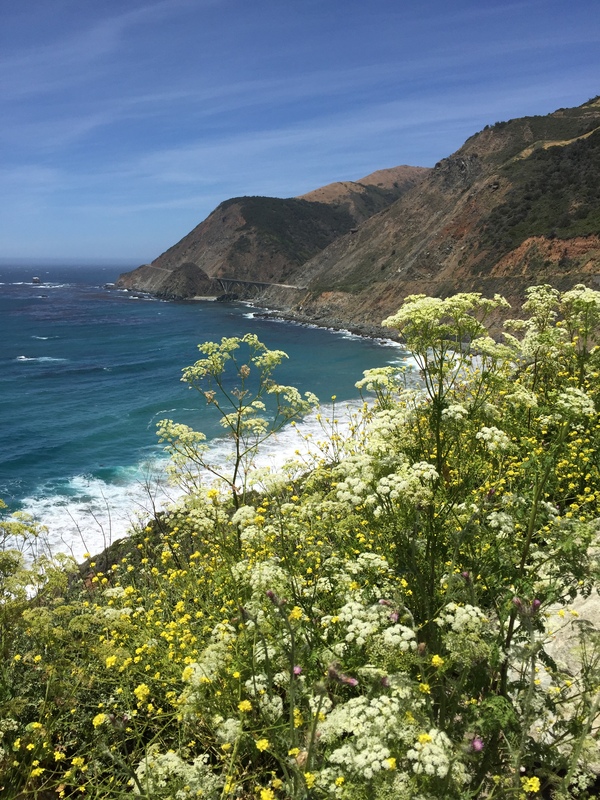 A drive from San Diego to San Francisco along the coast followed by an RV adventure inland to Yosemite, Lake Tahoe and up to Lassen volcanic national park . After a tough time health wise I was more than a little concerned about taking on an adventure of this size . Could I do it ? I also wondered if i’d ever get the opportunity to take on a big holiday abroad like this again . I was determined to do my very best to have a holiday to remember. With health issues due to Autoimmune disease my energy levels were not what they had been in the past, and physically at times arthritis had begun to make walking long distances a struggle. So we had prepared for this trip like a military operation particularly regarding eating out, as this is difficult for me even in the UK. 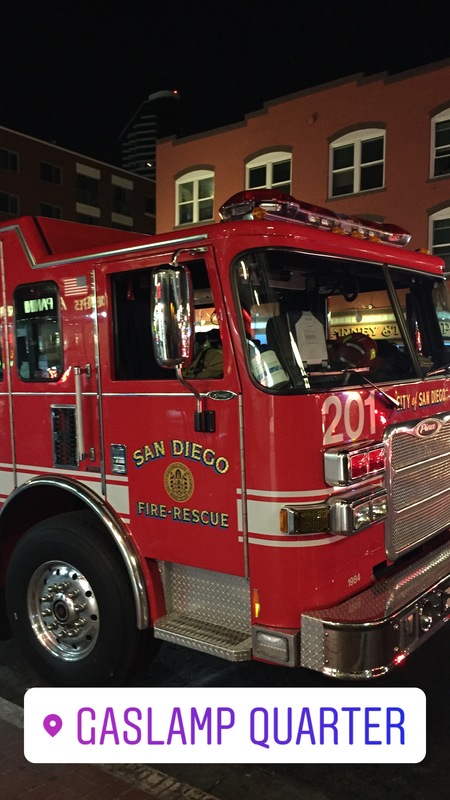 Our adventure started in San Diego experiences the noisy buzzy evening scene in the gas light district was quite a way to start . We ate at Lionfish at The Pendry , just like the streets around, it was dark and noisy. Almost all restaurants had been researched and pre planned back in the UK. A packed pink folder came with us on the entire trip . 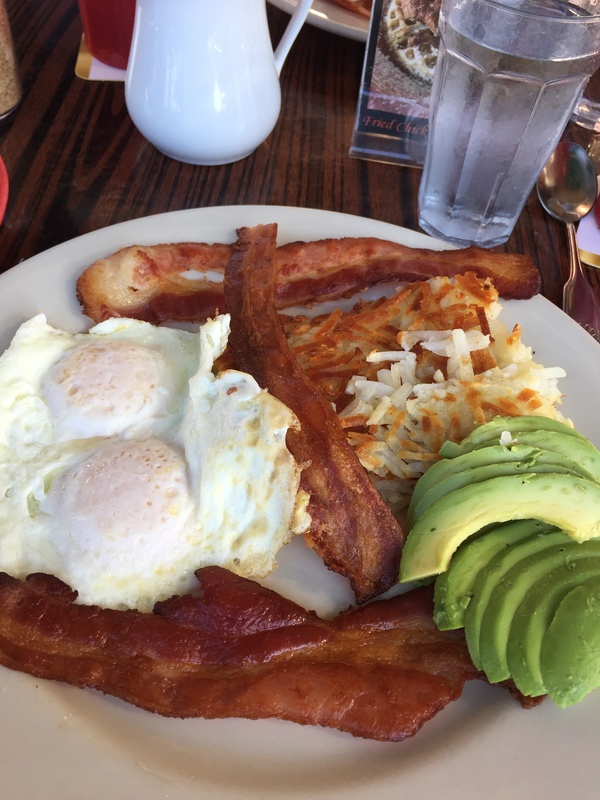 Possibly the best gluten free breakfasts of the entire adventure . Huge as you would expect in America and delicious! 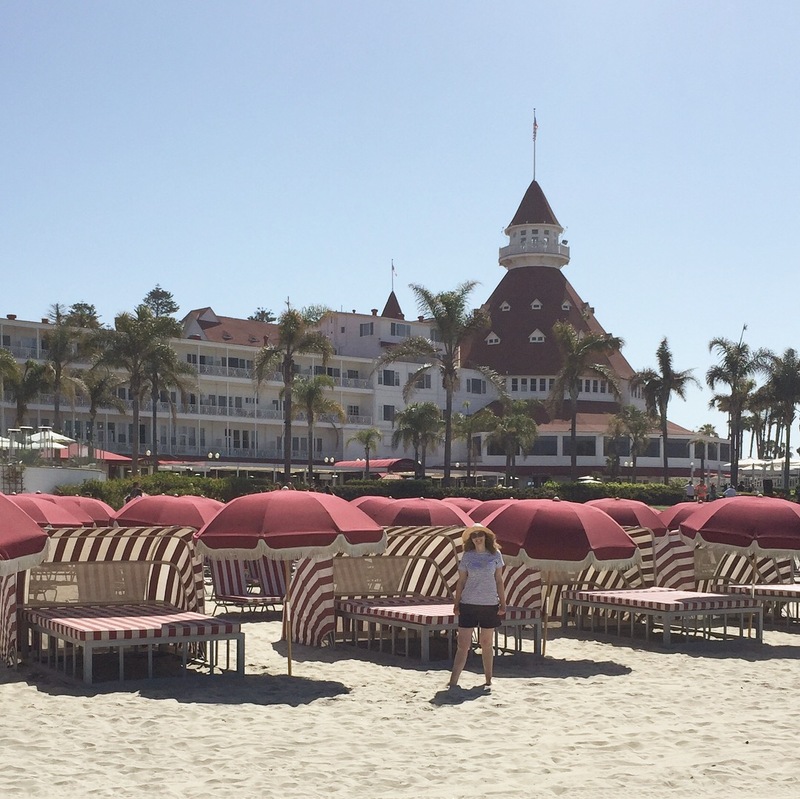 Visiting The Coronado Hotel was for me one of the best visits in this city , this iconic hotel was made famous by the movie Some like it hot . 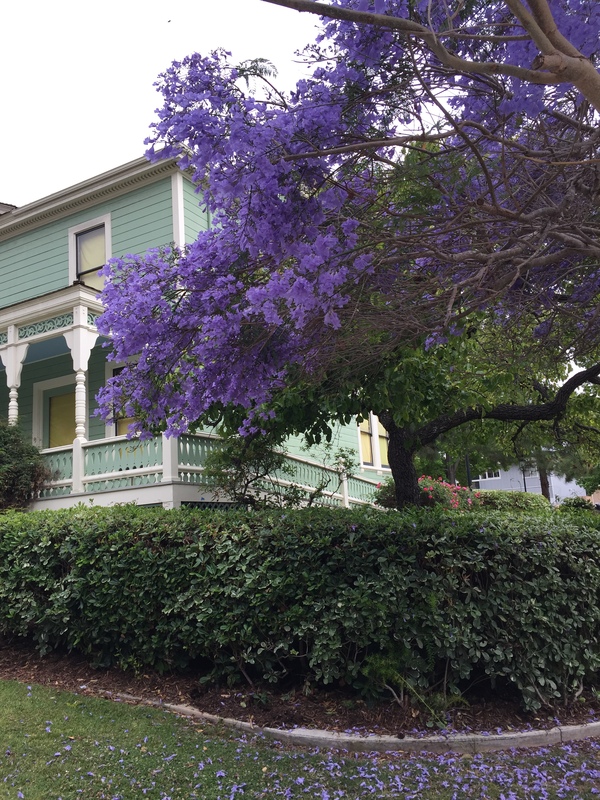 A happy accident was that as we arrived in San Diego the Jacaranda trees were in full bloom , beautiful lavender purple flowers decorated the streets . The trees looked absolutely stunning, and such an unusual colour . 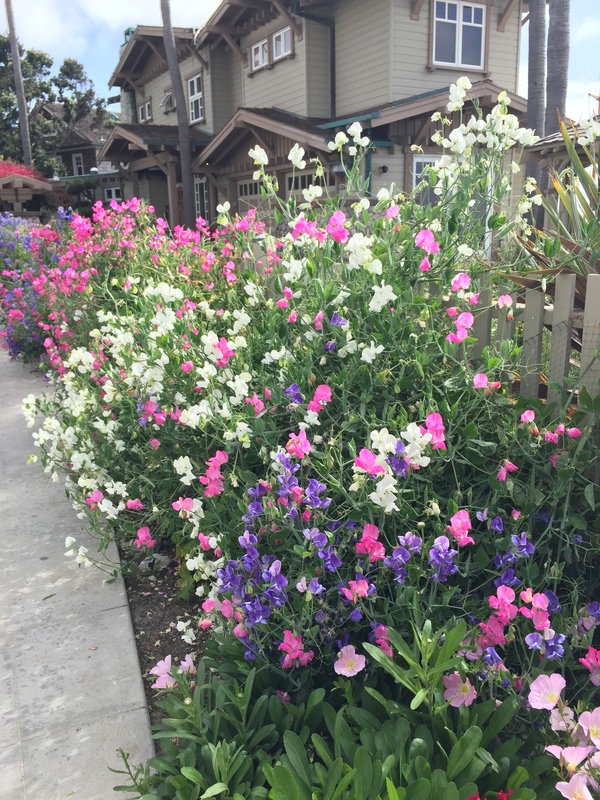 Nearby La Jolla beach, is also a must do , memories of pelicans flying over head , pretty houses with front gardens packed to overflowing with summer flowers . Well worth a visit. Restaurant recommendation for a special meal –Island Prime for incredible fresh lobster and steak. 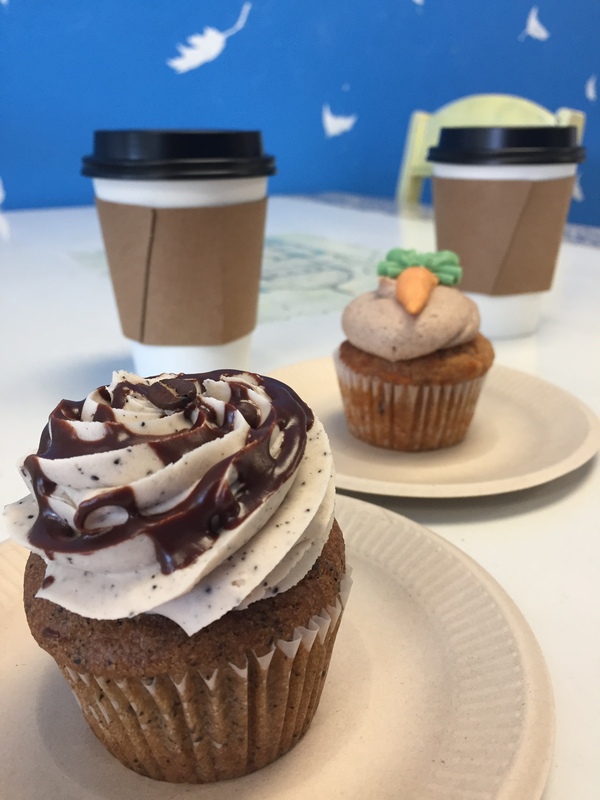 Also we enjoyed treats at the dedicated gluten free shop the Starry lane bakery it was well worth a trip while were we in San Diego, a diversion following an armed raid nearby didn’t put us off! Laguna Beach our next quick stop greeted us with heavy cloud and an empty beach . Lunch at Nicks was simple but delicious. Due to my additional food intolerances eating out is super difficult . I find that carrying a card similar to a business card really helps . Staff in almost every restaurant , cafe and hotel thanked me and said how helpful it was. Our next destination was Santa Monica with its brash brightly coloured pier and holiday makers making the most of the glorious weather. Here we stayed at The Viceroy where we were upgraded to a room looking out to the ocean. This was our base to explore Los Angeles . 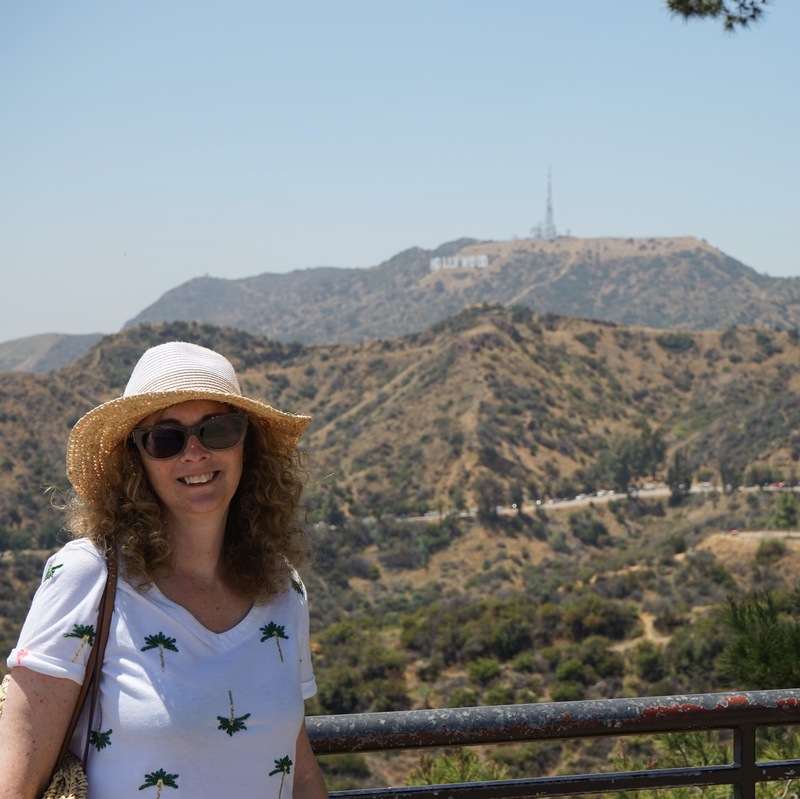 No first visit to La La Land would be complete without a Hollywood tour and Griffin Observatory visit. True Food Kitchen lived up to my expectation in the evening , a restaurant I had found online . Gluten free fish taco’s , strawberry and rhubarb almond crumble whats not to love ! So good we repeated the experience the next evening . LA was all we had expected , fabulous photo opportunities and memories to treasure. On along the coast in our hire car we came to Malibu I’m not sure what I expected , but it wasn’t what we found . The most pretty, quiet, smart pier which wouldn’t of looked out of place on our very own Norfolk/ Suffolk coast in England . 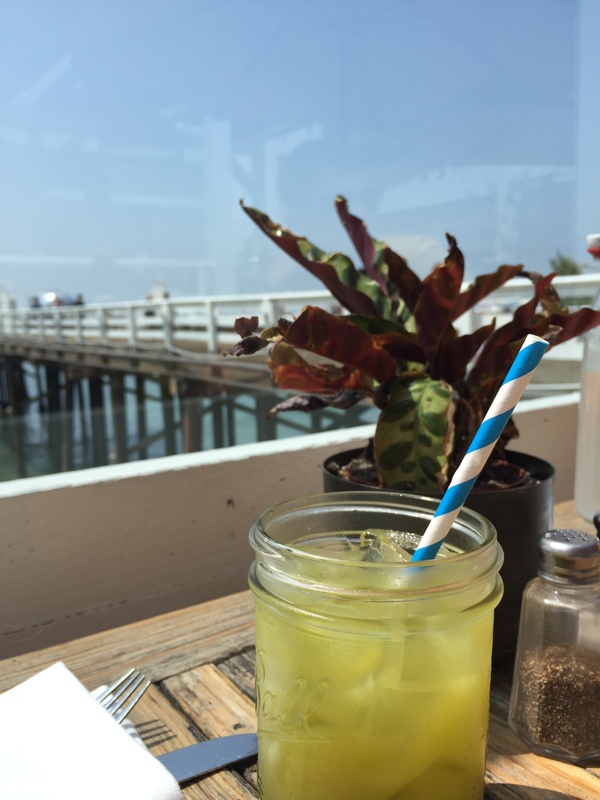 Although we had just stocked up with a large breakfast at Marmalade cafe we were enticed into Malibu farm a smart restaurant on the pier to sip on mint lemonades . Our helpful server gave us a great dolphin spotting tips . We drove on to the wild beach which was suggested to us and watched dolphin, seals and pelicans in the distance. One of the top stops on our adventure Santa Barbara was next , staying this time at an Air BnB, I immediately felt part of the community . Laundry sorted and shopping done at the local Whole Foods I could have stayed for a week! Actually by this part of the trip I was beginning to flag and definitely needed a rest day or two. I really enjoyed cooking and being able to eat things that we’d missed on our holiday so far. 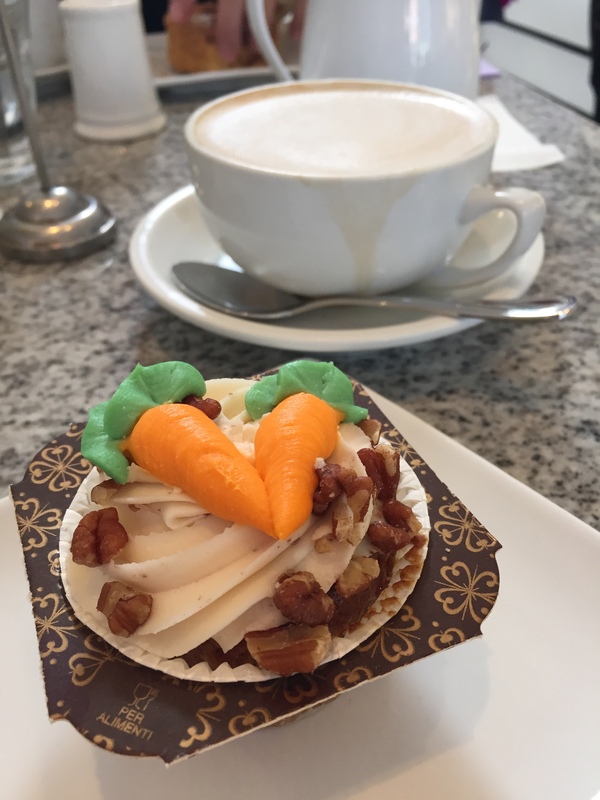 In the pretty town we visited Lilac patisserie serving gluten free treats . I can recommend. 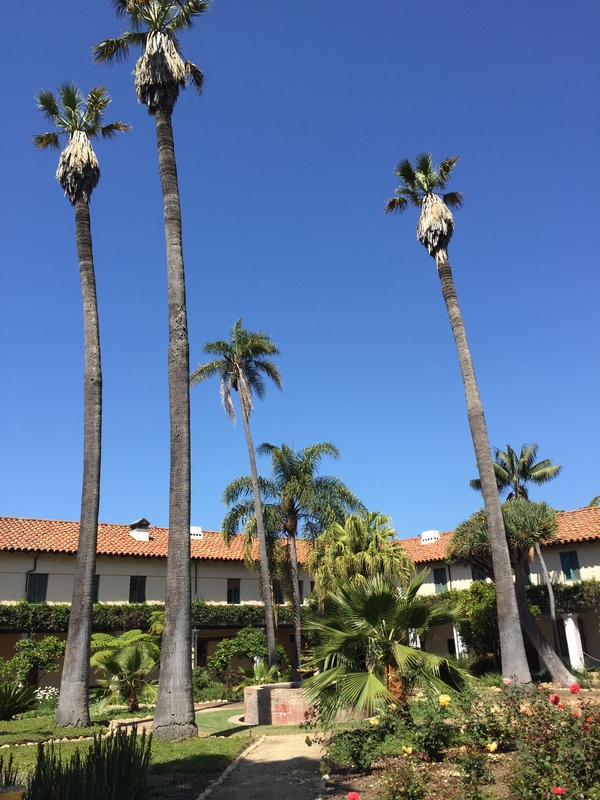 Santa Barbara is a place we would love to return too. Wining best beach of the trip El Capitan on along from Santa Barbara it was everything I love in a beach . 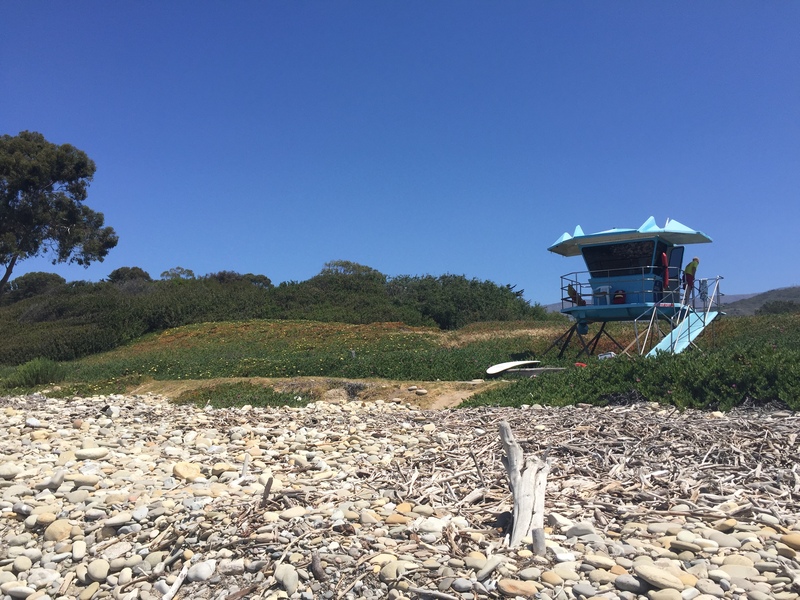 Backed by eucalyptus trees and edged with wild flowers and grasses this beach is a driftwood collectors dream . With sea lions bobbing up and family groups making camps under sun shades on golden sand , I wish we could of stayed longer . Not being able to take driftwood with us I spent the time gathering and building driftwood sculptures on the sand , I’m not one for sitting still. After seven days in the sunshine I noticed a huge improvement in my body. Far less aches and pains and better mobility. Warmth and sunshine is such a great healer. 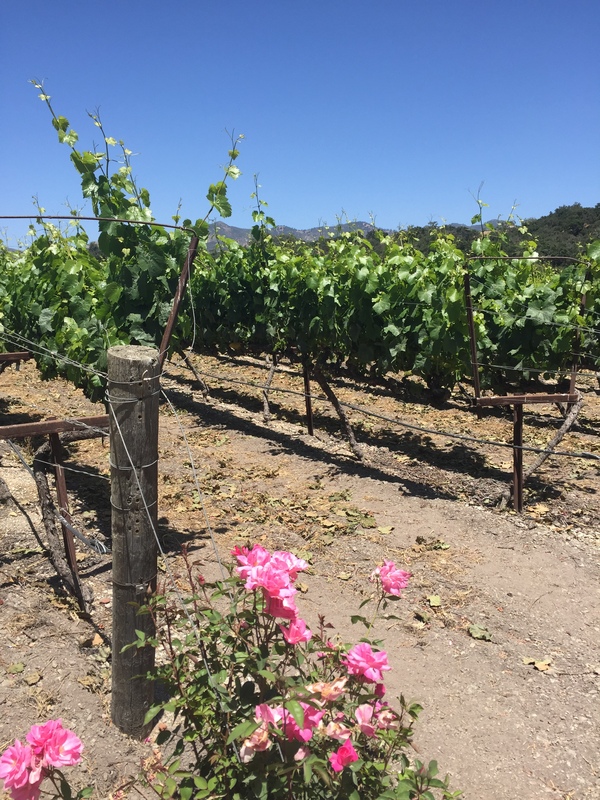 Leaving the beautiful beach we moved on to Fess Parker vineyard and winery , a stop for my husband . I watched as he tasted a selection of the wines wishing that I could have joined in. Being Intolerant to yeast is no fun! A quick picnic under the tree in the grounds and then back on the road. Next stop Morro Bay where it was blowing a gale , making sea otter spotting a freezing job . There were so many all bunched together laying on their backs , lots with babies holding tightly to their mothers in the windy conditions. On to Paso Robles starving we were glad that steak was on the menu and a gluten free pudding too, result! We stayed at The Inn in the town . I’m sure just reading this you’re exhausted ! Add in Chronic fatigue and you can probably imagine that by this point I was completely finished . Which was such a shame as what was to come up was to be so amazing. 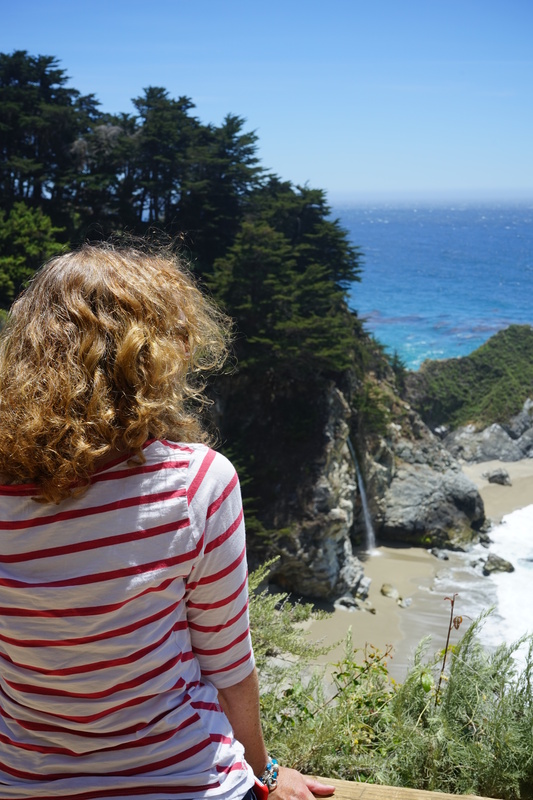 What followed was a monster journey , this was the day we drove the Big Sur You may remember it was in the news a while back due to big mud /rock slides . Most of the roads are now accessible but we did have to make one rather long detour through and over Los Pedro national park . Another huge high light of our trip happened here . As we drove up the winding narrow roads we were suddenly surrounded completely by millions of Monarch butterflies on their migration , there were thousands on the ground and in the air . An incredible and emotional moment to have witnessed . Through Carmel in thick fog and on to Monterey exhausted and thirsty I pretty much crawled into Portola Hotel, a large nautical themed hotel and was very glad we had done the research in advance and knew where we were eating . 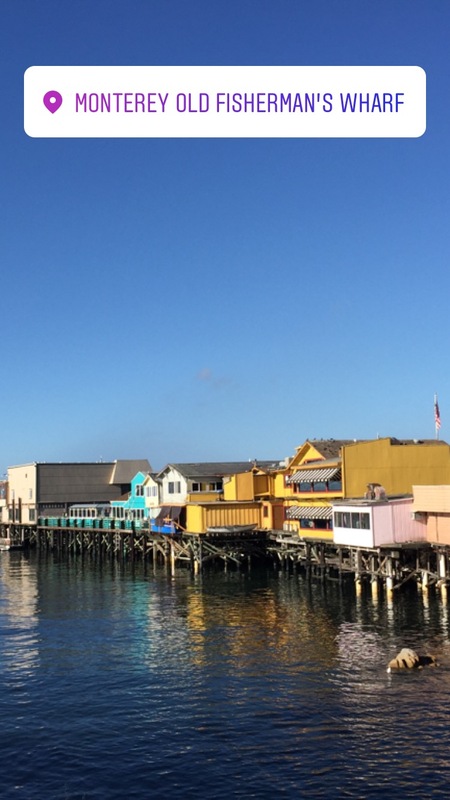 Along at Cannery Row we ate at Fish hopper , a whole Dungeness crab was just what I needed. 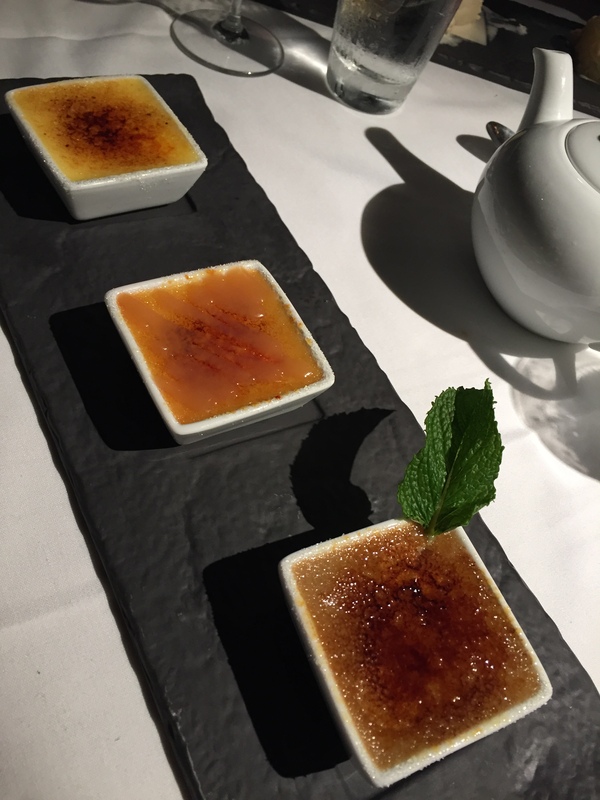 followed by Creme brûlée , my go to pudding on this trip. It was Starbucks breakfasts while we were in Monterey , hot coconut milk coffee was much needed as the temperature difference from the trip so far was very noticeable. About 16 degrees in June . 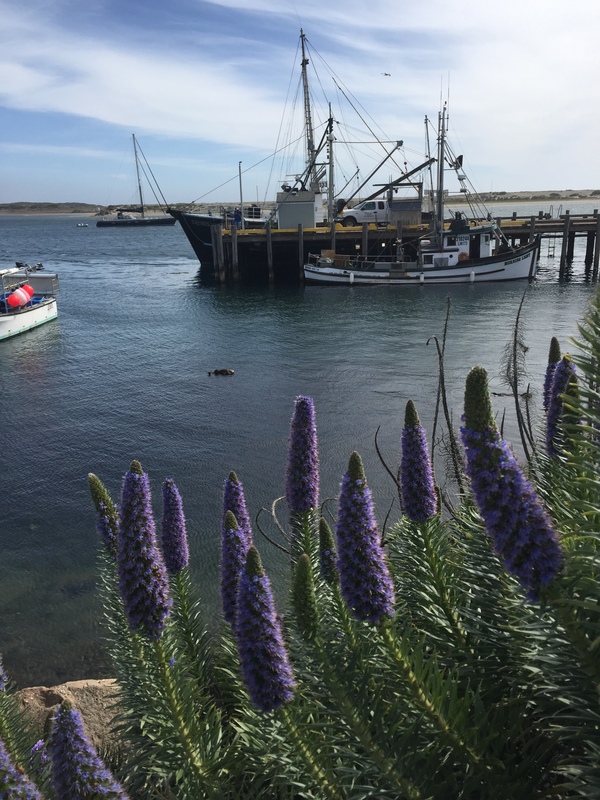 For nature lovers Monterey offers so much sea life, on one walk we spotted 20 sea otters, 10 seals and at least 10 sea lions on the quay . 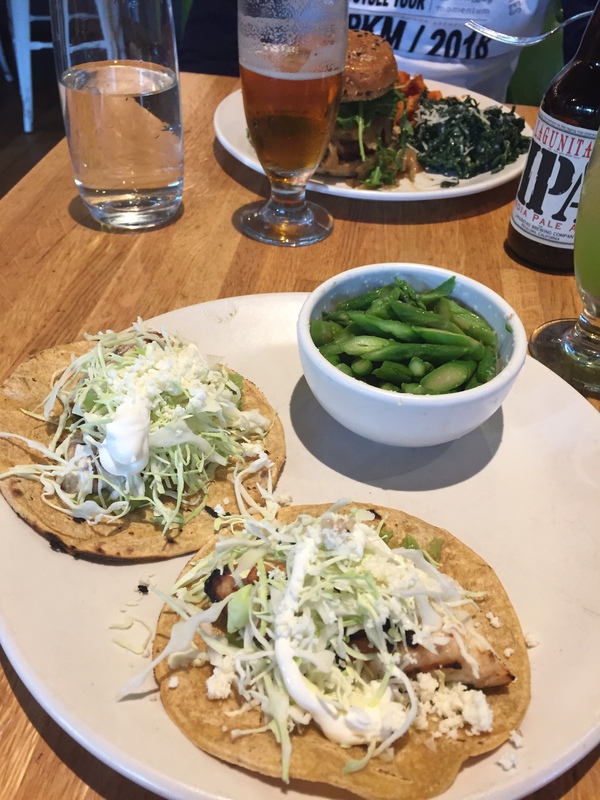 When we find a restaurant that works for me , we often go back again Fish hopper was a great choice. 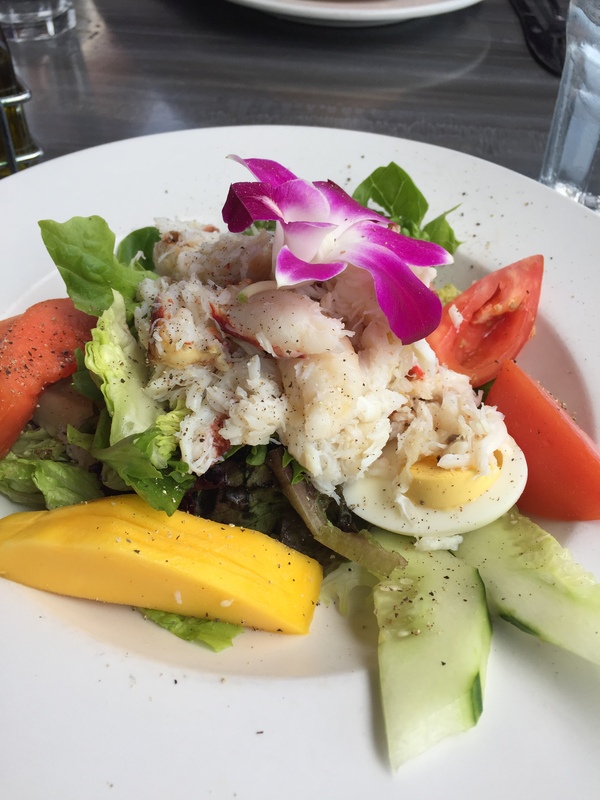 Crab salad and otter watching , whats not to like . Dinner was booked for Chart house cannery row , service was very poor and food was nothing special. Choices of main courses for me was very small almost everywhere on our trip . Onions , garlic , paprika , yeast make an appearance in so much let alone gluten . Most days my choice was some type of fish or seafood , broccoli and very occasionally a baked potato . Desserts were rare, no surprise there. Now you might be thinking this trip is about to come to an end , I think at the time my body was definitely ready to take a break . But no ! The adventure had only just begun…………. Recently McCain asked if I would be happy to try their new gluten free Home chips and review them . I normally have a bag of McCain original oven chips in my freezer as they are gluten free, so I was interested to try these new gluten free Home chips. I had family over on Sunday so we decided we would all give them a try for a quick supper. they cook straight from frozen in a hot oven for 20mins . I turned them a few times while they were cooking . The result was a chip with a crisp exterior and a soft fluffy inside, we all agreed they were a perfect chip . An essential for the freezer . The family enjoyed them, and as my home is gluten free I will probably keep some in my freezer for a last minute supper. When I have time I like to treat myself to homemade chips made just from potato or sweet potato and oven cooked in beef dripping for 25- 30 mins in a hot oven. I would be interested to know what you think , please let me know! I was not paid to write this review . A bag of frozen chips were given to me free of charge to test. I love all of Isabel’s free from mixes My favourites are the Dough balls and the Pizza mix. Both popular with my gluten eating family too. Today I thought I would have another go at Bagels using the Pizza mix. I’ve made these a few times before but knew they should have risen more in size than they had done. These latest yeast free gluten free Bagels are the best by far! This time I used 3 medium size eggs , rather than two eggs. I’m not sure if that made a difference. I also kneaded the bread dough for much longer. When it came to adding the bagels to boiling water , I left them in the boiling water for three minutes bubbling away ( I flipped them over once during this time ). I saw them double in size . I finally sat them on a tea towel to dry then popped them on a greased baking tray at fan 160c for 25mins. Some I sprinkled with sesame seeds some I left plain. I was astounded at the difference from my previous attempts. They were a great size, they did collapse a little when cooling but far superior to previous attempts. What will you fill your Bagel with ? On days like today I really miss buttered toast! In the early hours of yesterday morning I woke up with extreme stomach pain, a cramping pain that grew stronger by the hour. Anyone with IBD will know exactly what I mean . I have been fortunate enough to have avoided this for almost two years. I don’t as yet take any drugs but do stick to a very specific diet that works for me. Avoiding all grains especially gluten and reducing my dairy intake particulary cows milk . Butter seems to be fine for me, but I often use coconut oil and beef dripping in my cooking. I also avoid yeast, onions and garlic and paprika which have all been triggers in the passed. Anyway back to the other night, after the pain started the nausea and then vomiting and also strangely a runny nose. followed. Aching inflamed joints and all in all after several hours I was exhausted . The pain etc carried on for seven hours in all . My husband was a star and nursed me through the night. About 8.30am half an hour before I fell asleep .In despiration I whats app’d my Church home group to ask for prayer to take the pain away. I had eight replies in a few moments. I remember very little after this as I then slept until 3.30pm. My faith is a great strength to me and my home group are a huge support. Thankfully when I awoke the pain and nausea had gone. I never eat after a flare up like this and find that mint tea and water to rehydrate is all I can handle. Today I have managed homemade chicken broth which I had in the freezer. My broth/stock is just slow boiled chicken carcass and water. I’m hoping tonight to have cooked plain chicken a little mash and a few well cooked green beans . I was researching low residue diet today to see what was best to eat. I have never been given any dietary help with my diagnoses of Crohn’s disease so its all trial and error. I would be interested to hear from anyone else with Crohn’s Disease or Colitis as to how you manage your symptoms with diet and what you eat after a flare up. On days like today I really miss simple buttered toast. Bake off will be extra hard to watch tonight as its bread week. As its Biscuit week on The Great British Bake Off tonight I thought I would have a go at a new biscuit. I set about making a gluten free version using hazelnuts to decorate. I think if these had been presented to Paul and Mary on the ‘gingham alter’ I think they would probably have said they needed another minute in the oven as they were slightly softer than intended . Still delicious though.